It's probably not much of a surprise to any of you who've stuck around for awhile that I like things that reside pretty firmly on the quirky side. Maybe it's just my contrarian nature, but things that may push others away, or make them scratch their heads in puzzlement, or even flee in irrational, abject terror, tend to draw me in. Snakes. Spiders. Bats, rats (hence the blog name). Because how could you not like this?! And yes, bugs. Bugs of all kinds. (Well, mostly. Earwigs can go to hell.) I find bugs strangely fascinating and occasionally oddly cute, and the idea of a graphic novel about teeny, tiny anthropomorphic buggies leading little buggy lives, written & illustrated by a Buggyologist, which is a title I'm making up right now* sounds even more fascinating and oddly cute. 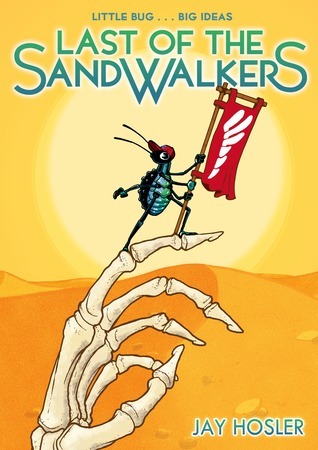 So if the idea of teeny, leggy little beasties who run little bug restaurants, and read little bug books doesn't make you run screaming into the night (especially when they're just ink and paper), then you may enjoy Jay Hosler's The Last of the Sandwalkers, and the quirkycrawlycute blog tour of FUN BUG FACTS. Now, onto Jay's much more interesting and less weird facts about the humble -- and adorable -- ladybug! *And by Buggyologist, I mean biology professor and drawer of cool bugs. Color: Black head and thorax, red elytra with black spots. I can remember the first time I showed my sons a ladybug (or ladybird, if you prefer). They were very young and entranced by the cute little red and black bump scurrying around my hand and up my index finger. I can remember both boys leaning in for a closer look as the beetle perched on the tip of my finger. Then, it suddenly lifted its elytra to fly away and all heck broke loose. The boys freaked out at this unexpected turn of events and both were in tears. This was the first time that I realized ladybugs could be scary. Now, to fair, ladybugs don’t bite or sting and they are perfectly harmless to humans. But, harmless is a matter of perspective. Ask an aphid what they think of ladybugs and you will get a very different answer (assuming you can find a talking aphid). Ladybugs are the scourge of aphid populations, which is why gardeners love them so much. They are so effective that aphids sometime purchase their own security force. In these cases, aphids will excrete a sweet sugary substance from their body for ants to eat and in exchange the ants will provide protection from ravenous ladybugs. If that isn’t scary enough for you, then consider the zombie ladybug. Small parasitic wasps sometimes prey upon ladybugs. These wasps will inject a ladybug with an egg that hatches and proceeds to grow inside and consume the ladybug’s innards. When it’s big enough, the wasp larva will shimmy out of the ladybug and spin a pupal case under the ladybug. The ladybug is still alive, but when the wasp injected the egg it also injected a virus that hijacked the ladybug’s brain and paralyzes it. As a result, the ladybug stands guard over the baby wasp while it completes metamorphosis. When the parasitic wasp emerges about a week later, most ladybugs die, but some actually snap out of the paralysis and start feeding. A few can even reproduce again! 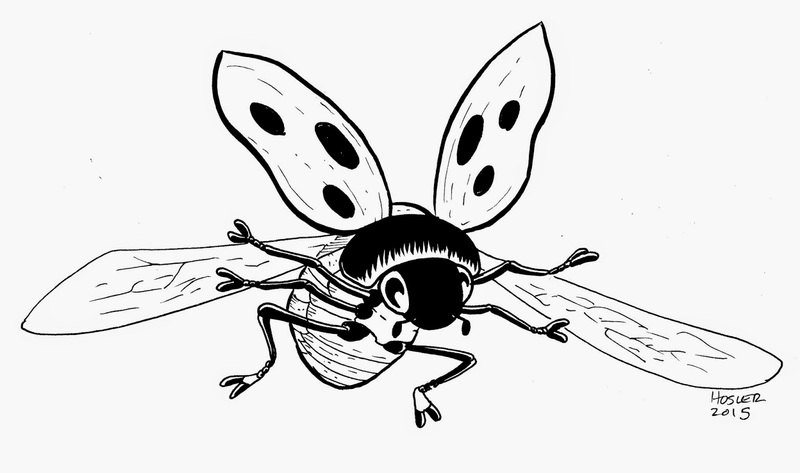 In Last of the Sandwalkers, our beetle adventurers owe their lives to a tough little ladybug named Cokie who showed them that not even the sky is the limit. Nestled in the grass under the big palm tree by the edge of the desert there is an entire civilization—a civilization of beetles. In this bug's paradise, beetles write books, run restaurants, and even do scientific research. One such scientist is Lucy, who leads a team of researchers out into the desert. Their mission is to discover something about the greater world...but what lies in wait for them is going to change everything Lucy thought she knew. Beetles are not the only living creatures in the world. 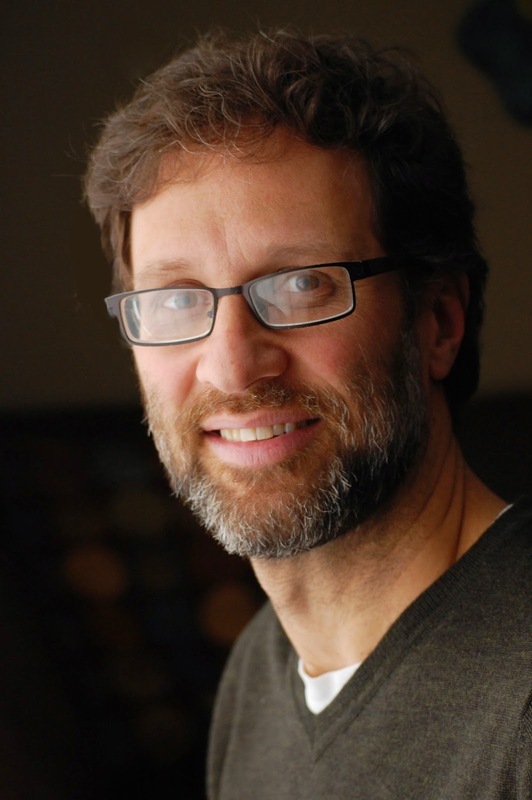 Jay Hosler is a biology professor at Juniata College, and a cartoonist. He enjoys telling stories about science and the natural world, and his first graphic novel (Clan Apis) won a Xeric Award and was selected for YALSA's 2002 Popular Paperbacks for Young Adults. His latest book, Evolution: The Story of Life on Earth, was a 2011 Junior Library Guild selection, a nominee for YALSA's 2012 Great Graphic Novels for Teens, and has been included in the Texas Library Association's Maverick Graphic Novel Reading List. He lives in central Pennsylvania with his wife and his two little nerdlings.